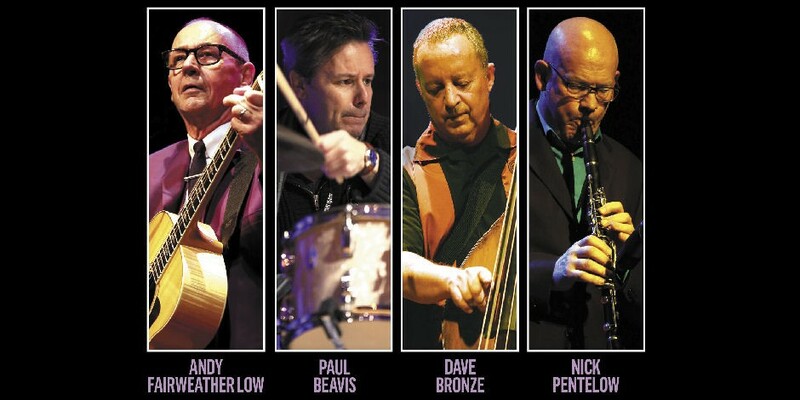 Andy Fairweather Low’s story looks like the perfect example of how to become a legend. He first came to prominence as the lead singer in Amen Corner. The 60s saw them clock up hit after pop hit. Songs such as ‘Bend Me Shape Me’, ‘Hello Suzy’, ‘( If Paradise is ) Half As Nice’ are internationally remembered to this day. But if you were paying close attention you might have picked up a clue in the magnificent ‘Gin House’ to Andy’s future musical collaborations. Since the early days Andy has gone on to work with Eric Clapton, George Harrison, Bob Dylan, Jimi Hendrix, David Crosby, The Band, Elton John, Roger Waters, Richard and Linda Thompson, Dave Gilmour, The Who, BB King, Joe Cocker, Steve Winwood, Donald ‘Duck’ Dunn, Jimmy Page, Ronnie Lane, Linda Ronstadt, Roddy Frame, Emmylou Harris, Joe Satriani, the Bee Gees, Jeff Beck, The Impressions, Lonnie Donegan, Ringo Starr, Steve Gadd, David Sanborn, Benmont Tench, Warren Zevon, Charlie Watts, Mary J. Blige, Dave Edmunds, Georgie Fame, Bonnie Raitt, Otis Rush, Phil Collins, Van Morrison, Gerry Rafferty, Chris Rea, Buddy Guy, Chris Barber, Jackson Browne, Bill Wyman, Sheryl Crow, Clarence ‘Gatemouth’ Brown, Pete Townshend… and hundreds more. A world tour as musical director with Roger Waters band then a European tour with Bill Wyman’s Rhythm Kings might be difficult to top for most people – but not for Andy Fairweather Low who just segued smoothly into a major solo tour last summer with some of the world’s finest musicians in his band. Following an acclaimed UK Tour in Autumn 2012 Andy completed a third tour with The Low Riders in Germany. 2013 saw Andy & The band opening the shows on Eric’s European tour headline The Americana Festival and complete their first tour in Japan with 8 shows in Tokyo. Their UK Autumn 2013 tour in support of the Zone O Tone was so well received that further early Spring dates in 2014 were added in the UK and Germany and 2014 started with the band on Bob Harris’ rock show playing in session and, when they came back from Germany before picking up their UK tour leg, they appeared for two nights as guests in an all star cast celebrating Albert Lee’s 70th birthday at The Cadogan Hall, London where they were also enlisted as the house band for a number of household names. This DVD and music CD package will soon be released. Late in October 2014 Andy & The Low Riders played a show at The New Theatre in Cardiff as part of their tour and the show was both filmed and recorded and will be released as a DVD / Double live CD this Spring as 2015 sees the latest new chapter in the story develop.